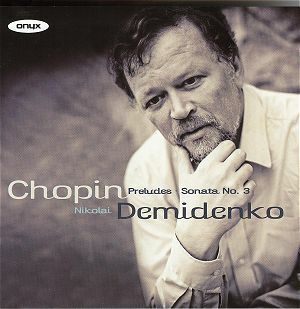 I’m sure I am not alone in finding Nikolai Demidenko’s playing maddening, frustrating and enlightening in roughly equal measures. He’s divided critical opinion in the past, and I found much to admire but odd idiosyncrasies to rant about in his reissued disc of Chopin’s Four Scherzi on his one-time home label, Hyperion (see review). Well, according to his new label Onyx, he’s somewhat re-launching his recording career with the composer he started with, Chopin. The results are, to say the least, mixed. We can’t complain about value for money here, with the whole set of Op. 28 Preludes – which in the early days of CD often featured on their own - and the Sonata No.3 thrown in for good measure. The opening C major Prelude gets things off to a fine start, the intricate rhythmic flow well controlled and interesting inner voices brought out; but he then for some unaccountable reason holds the E natural of the final chord over into the next A minor Prelude, the first time I’ve ever heard this. It works well enough, as E becomes the dominant of the following chord, but just sounds rather odd at first, and I’m not sure of his evidence or authority in doing this. He certainly brings out the harmonic daring in this little gem, making the rocking dissonance in the left hand sound as if it’s from a century later. Throughout the set there are examples of little distortions of phrasing and dynamics that will either illuminate or get on you nerves, depending on how you view these things. The slower Preludes seem to suffer worst in this respect. Why so much mushy pedaling in the famous A Major (No.7)? Why is the dynamic taken down to mezzoforte in the E major (9)? Why is the lovely little B major (11) taken at such a slow pace that any vivace that Chopin asks for all but disappears? No.13 in F sharp also suffers badly from lethargy, although the singing line is beautifully maintained. In fact, there are plusses that are genuinely welcome. He maintains a nice steady tempo for the glorious A flat Prelude (17) which is so often pulled around, and he mercifully refrains from thumping out the bottom A flat ‘tolling bells’ at the end, the first time I’ve heard it as subtly done since Cortot. That said, he then ruins the following F minor by pulling the phrasing and dynamic around so much as to disfigure the piece; instead of starting allegro molto Demidenko is just about moderato, then speeding up to a virtual presto by the end. This is volatile, unpredictable playing that would probably excite immensely in the concert hall could be a problem for repeated listening. It was a relief to turn to Pollini’s imperious 1974 account on DG, superb technique allied to a steely intellect. In fact, though Demidenko’s technique cannot seriously be questioned, by comparison he does rather labour over some of the subtler virtuosic passages, such as the left hand leggieramente of the G major (3), which is a tad heavy and uneven for me. The B minor Sonata is a relatively safe reading at the side of the Preludes. The first three movements are commendably ‘straight’, the pianist putting himself firmly at the service of the composer. Highlights include a majestic opening – complete with controversial exposition repeat - and beautifully lyrical slow movement. However, Demidenko can’t resist his old tricks in the introduction to the finale. Here, what Jeremy Siepmann’s lively note calls ‘among the most stirring calls to arms ever penned’ is once again undermined and reduced to a whimper by starting far too softly then increasing the dynamic over the sixteen chords. Sorry, but it just sounds plain wrong. Once again, turn to Pollini on DG from 1986 and you immediately realize that playing it as the score asks for is always the safest bet. Of course we want individuality as in, say Alex Slobodyanik’s EMI Debut account, but for me Demidenko takes things too far too often. The Preludes are hardly under recorded, and for my money you should stick with Pollini, Kissin (RCA) – who is himself unpredictable but sounds almost safe by comparison – or the more recent Rafal Blechacz also on DG. Demidenko fans may want this, but with rather distanced, occasionally harsh sound from his Fazioli grand (pianist, instrument, hall or engineer?) it all adds up to a rather unsatisfactory whole.